A 24-year-old woman who was slashed in the face by a stranger in a random attack as she walked to her early morning job said her attacker followed alongside her before he lashed out. "The walking pace kind of changed, and I noticed it," said Amanda Morris, who lives in Brooklyn and works in Chelsea. "My gut instinct told me something was wrong. But I didn’t think anything would happen because you don’t think these things happen." Morris said she "kept walking and walked faster" to get past the stranger on the Chelsea sidewalk, and that's when he struck. Kari Bazemore, a 41-year-old man from the Bronx, was arrested Wednesday evening as a suspect in the attack. A man walking near St. Patrick's Cathedral around 6 p.m. said he recognized Bazemore from surveillance video he had seen on television. The man called 911 and followed Bazemore. He eventually ran into police officers, who called for assistance and arrested the suspect. 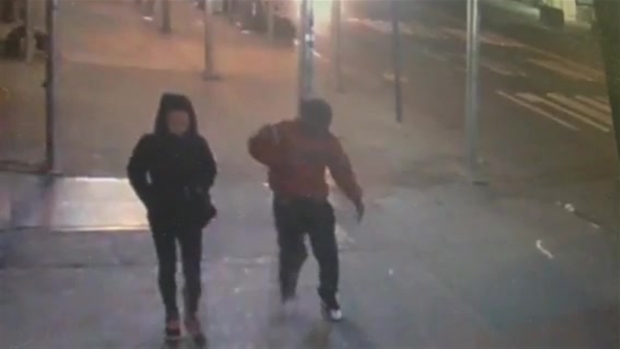 Surveillance video shows the attacker wearing a red jacket and green hat walking next to Morris on the sidewalk. He then quickens his pace and lunges at the woman with a sharp object. 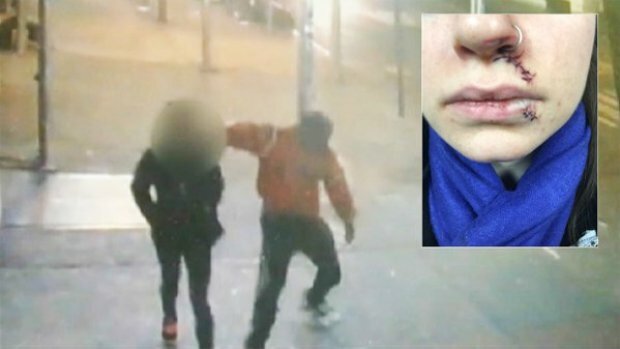 The woman, stunned, grabs her face and turns to look at her attacker, who is seen running out into the street and out of view of the camera. The bloodied victim stumbled into the 24-hour Malibu Diner on Seventh Avenue near West 24th Street and got some help from restaurant workers. 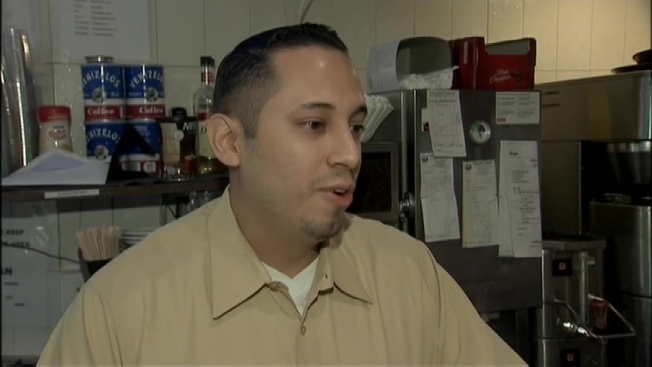 "She was scared, really scared, didn't know what to say, shaking," said night manager Ruben Garcia. "It was crazy." She suffered bruising on her nose and cuts on her upper and lower lips that required seven stitches to close. "I wish I could have reacted better and gotten a better description but the first thing I thought was I have to get inside a building — just get inside," Morris said. She said she was in the “wrong place at the wrong time” and her thoughts were with her friends who also work in Chelsea. Roommate and friend Brad Habel said, "You see the footage and it's just horrifying. It's nothing I would expect. I walk that path thousands of times." 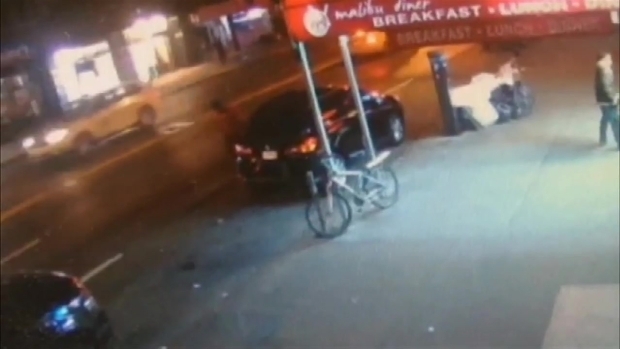 Surveillance video shows the man wearing a red jacket walking next to the victim on the sidewalk. He then quickens his pace and lunges at the woman with a sharp object. She grabs her face and turns to look at her attacker, who is seen running out into the middle of the street and out of view of the camera. Morris said she's taking some time off from work to let the cuts heal and calm her nerves. A police cruiser was stationed outside the diner where she stumbled in after being attacked as officers continue searching for the attacker. Bazemore has been charged with assault and criminal possession of a weapon. It wasn't immediately known if he had an attorney who could comment on the case. Reporter Brynn Gingras contributed to this report.